With continuous advances in diagnostic imaging technology and utilization, the workload in radiology has increased considerably.1 According to a study on radiology workload published in 2015, "the average radiologist interpreting CT or MRI examinations must now interpret one image every three to four seconds in an eight-hour workday to meet workload demands. "2 As the workload increases, so does the need for faster, more efficient, and accurate ways to meet the demand. Such advances would be like adding an additional radiologist at no additional cost. Here are six suggestions that can help expand your team of experts without actually adding a body or a paycheck. Break down the data silos. • thinks the way you do and adapts file and data management based on your changing medical data needs. Turn your radiology workflow into a symphony. When every second counts, you don't want to get bogged down tracking which radiology specialist should read which study. From referring physicians who prefer a particular radiologist to interpret their diagnostic studies to subspecialty radiologists who are skilled in advanced diagnostics, it is important to get the right study to the right radiology specialist without slowing down the workflow. You need a way to orchestrate the handoff to the right interpreting physician; harmonize all of the multitasking steps; enable consolidated access to patient images, subspecialists, peer review, and patient information across multiple sources; and orchestrate your workflow without missing a beat. A workflow orchestration solution can help. Look for a solution that leverages your existing health care information technology investment and doesn't require a complete system replacement. With advances in digitalization, your system should go beyond the basic worklist. Great care requires a complete picture of relevant patient data. Even with complex enterprise EMR implementations, necessary patient data exist, but they aren't available when and where they are needed. EMRs are transactional and not built for collaborative care. It is difficult to gain a complete, longitudinal view of a patient's medical history across a lifetime or even at a particular point in time. Diagnostic data are often missing or incomplete. Having one electronic health network that can be shared between the care team and the patient may be the answer. This facilitates teleconsultations for more cooperative patient care. For radiologists, having the complete picture of the right patient cuts down on duplicate studies and helps radiologists make focused, informed impressions and interpretations. Speed up your turnaround time. We all know the saying: Time is money. For radiology, this is even more relevant. It is essential for a radiology department to deliver high-quality reports as soon as possible to their referrers. Of course, one reason for this is that reimbursement is based on the reports that are delivered, but it's also important to stay competitive in the digital age. Keep in mind, you are competing with teleradiology companies around the world whose business models rely on fast report turnaround. So, what can you do to speed up your turnaround time? Provide an infrastructure that doesn't depend on where the radiologist is. Radiologists can work anywhere. With the right solution, you can distribute cases to the correct specialist to expedite turnaround. Take the work out of workload. 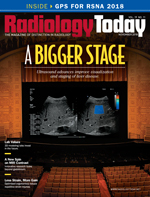 The top challenges in radiology worldwide are workload pressure and diagnostic errors. Take a look at some workload facts: As stated earlier, the average radiologist interprets one image every three to four seconds. One hundred-plus average studies per day and workdays that exceed 12 hours are not unusual. • 19% of lung cancers of 16 mm nodule on chest radiographs were missed. AI can be a radiologist's new best friend. Picture a world where AI has processed all relevant patient data and image information at the same time that the images are being created. Within seconds, AI prepares the report in almost real time and sends it to the radiologist's workplace. Finally, the radiologist either confirms or edits the report and signs off on it. With the support of AI, radiologists can prioritize their time to look deeper into more complex cases. The greatest minds—in radiology—think alike. Speaking of complex cases, what if your diagnostic images came out exactly the way you want them in the first place, no rescanning needed? Wouldn't it be great if you could choose the best-regarded scan protocols from top radiologists in the field and distribute them with a click of a button to all your scanners? Wouldn't it be great to get a second opinion right away, with no waiting? What if you could leverage a huge network of the greatest minds in diagnostic imaging, in a secure way? Think about how much time this could save. You can leverage a cloud-based network where experts around the world are sharing their best-in-class scan protocols for MRI and CT. In addition, you can use such a network to share images, get second opinions, or compare images with similar cases. There are many things you can do to leverage your most important resource—your radiologists. Start by providing the right infrastructure to help them focus on what counts most: better outcomes for all patients, no matter how their volume. — Brian Drozdowicz is the vice president of digital services for Siemens Healthineers North America. 1. Bhargavan M, Kaye AH, Forman HP, Sunshine JH. Workload of radiologists in United States in 2006–2007 and trends since 1991–1992. Radiology. 2009;252(2):458-467. 2. McDonald RJ, Schwartz KM, Eckel LJ, et al. The effects of changes in utilization and technological advancements of cross-sectional imaging on radiologist workload. Acad Radiol. 2015;22(9)1191-1198. 3. Shaywitz D. Data silos: healthcare's silent shame. Forbes website. https://www.forbes.com/sites/davidshaywitz/2015/03/24/data-silos-healthcares-silent-tragedy/#3cea14622907. Published March 24, 2015. 4. Berlin L. Faster reporting speed and interpretation errors: conjecture, evidence, and malpractice implications. J Am Coll Radiol. 2015;12(9):894-896. 5. Lee CS, Nagy PG, Weaver SJ, Newman-Toker DE. Cognitive and system factors contributing to diagnostic errors in radiology. AJR Am J Roentgenol. 2013;201(3):611-617.